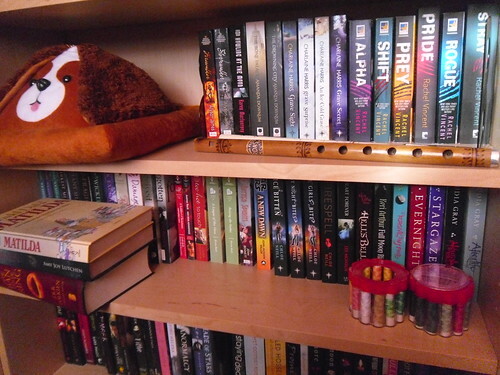 Lola’s Ramblings: How do you shelf your books? I find it interesting how there are so many different way to rearrnage your shelves. Some shelf their books on alphabetical order, others by authors, other by colours or book size or any combination of methods. 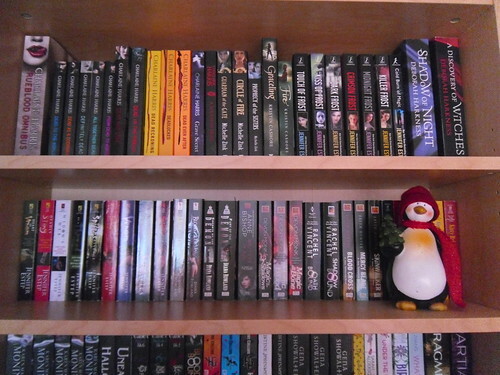 Today I want to show you my bookshelves and tell you a bit about how I shelf my books. So we have 4 bookshelves. The smaller one is for our manga’s/ graphic novels, which hasn’t had any recent additions after the japanese Yotsuba manga’s my boyfriend bought to practice his japanese. Next to that is mostly my boyfriend his bookshelf. My bookmark photoalbum is actually on there and some of my high fantasy books, like the Shanara series and the Wheel of time series in dutch. Then the two large ones on the right side are both for my books. As you can see I like to put a lot of other small things in front of my bookcases as we don’t have that much shelf space in our house. It might looks a bit messy, but I like it. So how do shelf my books and arrange my books on my shelves? Well I basically have two rules, each book must be on the shortest shelf possible if there is still space on that shelf and series must stay together (I have one series that breaks this rule). I have Billy IKEA bookshelves with two extra shelves each for maximum capacity, the downside of this is that each bookshelf has two very short shelves, where only those short mass market paperbacks fit on. So when I have those they go on the shortest shelves. There are also slightly higher and even higher shelves, with thise I mean the height of the shelf itself not how heigh on the bookshelf they are. I try to fit each book on the shelf that is just high enough for that book. So there is more room on the higher shelves for the books that only fit there. For some reason I always end up with more higher books than mass market paperbacks. The larger books need their place on the higher shelves. Then my second rule is to not break up any series. So if a series has different formats it can get an upgrade to a higher shelf as I don’t want to break it up. Which is very unfortunately in the case on my Kelley Armstrong collection which can’t fit ont he shortes shelf as the last few books in the series are higher, so I had to move them to another shelf. I don’t mind breaking up authors, so if I own multiple series by the same author, they can be on different shelves. I feel a bit sorry for Rachel Vincent though, all of her series are on a different shelf and I even split up her Unbound series. The Soul screamers are large, the shifter series on a short shelf. The Stars Never Rise stays next to the hardcopies. And the Unbound series is on a totally different shelf, Blood Bound on one shelf and Shadow and Oath bound on another. And then I own Lion’s Share and Hunt in e-copy. Kelley Armstrong and Richelle Mead are both fortunate enough to have mostly their own shelf. I have so many Kelley Armstrong books, they don’t even fit on one shelf anymore, so some are with the hardcopies now and others on the shelf below it. Jennifer Estep her books are on two different shelves, but those shelves are on top of each other, so at least they are close. Even though I have a weird system, I usually know quickly were to find each book. This is our manga bookshelf. I am very porud of my complete series Hikaro No Go. 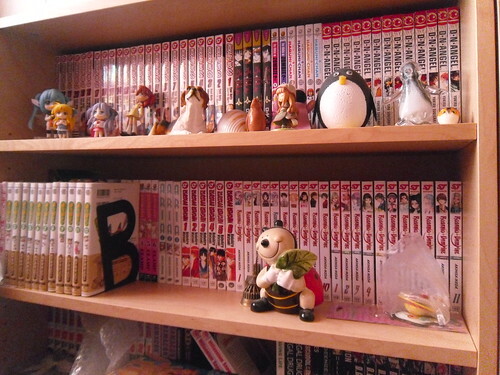 Beside that I mostly own a few books of a manga. Manga’s are pretty pricey and I haven’t bought any new ones in a long time. There are some Lucky Stars figures and a Sora No Otoshimono figure in front of it. The penguin was a present from my boyfriend, he made it himself. Then there is a figure of a beagle, they are one of my favouriote dog species, I like their colourings. And a few more penguin figures as I collect penguins, they are one of my favourite animals. This is the top shelf of the right bookcase. The top shelf is a high shelf and the whole Sookie Stackhouse series is there, because of the thick three books in one book. Then we have a trilogy by Michelle Zink, ugh can I say how much I dislike the fact that Prophecy of the Sister is shorter than the other two. then Fire and Graceling, I still haven’t bought Bitterblue. Followed by the Mythos Academy and Cold Burn of Magic. Then the two big Deborah Harkness books. The shelf below is a short shelf, it also has Jennifer Estep books, namely her Elemental Assassin series. Then Diana Rowland her Kara Gillian series and a few other Urban Fantasy mass market paperbacks. Also looking at my shelves I realize how weird it is that some series like the Sookie Stackhouse one go from right to left, while then on the next shelf we have the elemental Assassin series which I ordered from left to right. And I don’t mind at all. One shelf down we have two slightly higher shelves again, which features the Fever series and the Hunger Games. A few first books in a series or multiple books and a few unfinished series as well. On the shelf below we have a few David estes books and Twillight and a few puzzles in front of it. Did I mention I love puzzles? Oh and the Camp Boyfriend series is on this shelf as well. This is my Richelle Mead shelf, it has Bloodlines, Vampire Academy, Georgina Kincaid and Dark Swan. It also has the first book in the Age of X series. All on the same shelf. One Soulless arrives, it won’t be able to fit on this shelf I am afraid and then Richelle Mead will be on two shelves as well. The only four books that aren’t from Richelle Mead are the two SJ Pajonas and two Rachel Harris books on the left. 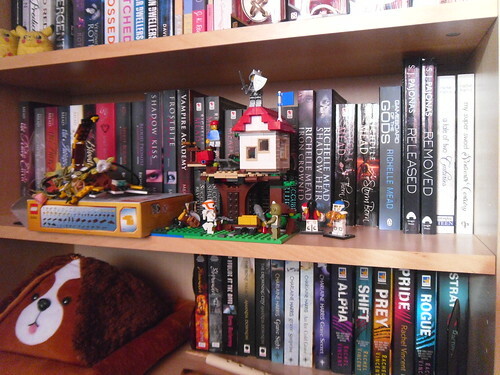 There is a lego Treehouse in front of it and some random lego figures I acquired. Below that we Charlaine Harris her Harper Connely series and Rachel Vincent her Shifter series. And my doggy bookrest. And the last shelves of this bookshelf. Next bookshelf! This one starts with two shelves with lots of different series. It’s quite a mishmash of books and genres on these shelves. And there is a picture of my grandma and grandpa and a Maru calendar from 2013 that i decided to keep as it was too cute. There is also a stack of bookmarks. One of my favourite shelves, my Kelley Armstrong shelf. This shelf exclusively holds books by Kelley Armstrong and I own almost all of them in paperback. The few hardcopies are on the shelf above it. And I recently has to branch out to the shelf below as they don’t fit on one shelf anymore. I am still cringing when I look at all the different shapes of my Otherworld series. I actually have the last book in hardcopy as I didn’t want to wait till the paperback release. The Blackwell Pages and Darkness Rising are the only two series that match. So sad. 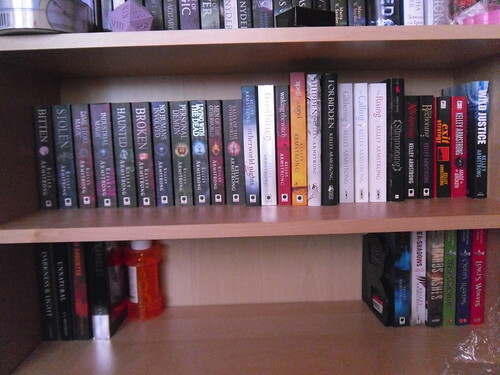 Here is Rachel Vincent her Soul Screamers series and my Dutch harry Potter book collection. My Harry Potter books are in pretty bad shape as I wans’t as carefull with my books then and I read them multiple times and my mom read them as well. I hope to once buy the whole series in english as well. This shelf also has my Fate Core roleplaying books and a Star Wars book. How do you shelf your books? I always enjoy looking at other people’s bookshelves! My bedroom is where all my books live and it looks like bedlam right about now! Due to the weight of the books the shelves are sagging so in the next few weeks my dad plans to put brackets on the shelves to give them super strength and then I can spend some time sorting things. I love changing my bookshelves around-I find it like therapy! When I’m finished I’ll put some photos up on the blog to show why my room is called THe Book Cave! In my previous house most of my books where in my bedroom as well, but in our current house the bookshelves didn’t fit in our bedroom and we had a spare room anyway. Inever had an issue with shelves sagging,but maybe that’s because I only have paperbacks and extra shelves? I hate changing my bookshelves around, I like knowing where everything is and due to my different height of shelves, there’s only a limited amount of changing I can do. Especially my long series stay on place, the seperate books or short series get changed around sometimes when I receive new books. 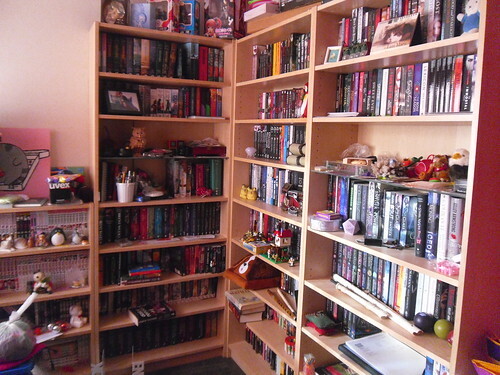 I would love to see some photo’s of your bookshelves! I only keep a handful of physical books at a time since I gave hundreds of them away years ago. I know, blasphemy! lol. But I used to need them to match size-wise. So I made sure that all books in a series matched. Then had hardback and paperbacks separate. Love your shelves! At least you gave them away so other people can enjoy them, that’s better than throwing them out. I keep thinking I might have to do away some of the books I probably won’t read (again), but I am a bit of a hoarder and have a heard time throwing or giving things away. I would love to have more of my series match, but unfortunately I have quite some mismatched series. Yours are bookshelf goals Lola! Mine are pretty randomly ordered as well, with the exception of my few rules for my bookshelves. I once considered ordering them alphabetically, but it sounds so unhandy that when you get a new book you have to move everything around. Those pictures are awesome, Lola! I have fewer paper books than you do, and I need to have shelves specifically for books I need for Uni, and another one for the classes I teach. Then, for my shelves where I have the books I read for pleasure, I change them around a little bit. I try to keep series together, because it’s jus easier to find the books that way, but I love to play with colors in different ways, which is why I make changes every now and then. It took me some time before I finally got an e-reader and before that I bought all my books in paperback, so I acquired quite some of them back then. Nowadays my collection of books grows less fast. Sounds like a good idea to arrange your shelves for where you need them for. I also prefer to keep series together, I like seeing the whole series next to each other. Your shelves look nice! 🙂 I shelve my books alphabetically by author and within series. But, I also bring my books forward to the front of the shelf so that they all match and the crookedness is in the back. I do put some knickknacks on my shelves, but normally, I put them as bookends or on top not in front of the books. I’ve thought about changing that with a few things, though. Thanks :). I like the idea of shelving books alphabetically as everything is eays to find then, but I can only imagine what an effort it would be when you get a new A author book and have to move everything. I have so many knickknacks I put them in front of my books, although it makes it difficult to get books from my shelves sometimes. Cool! It’s fun to see all the books you have! I shelve my books by genre and then by author. All of my chicklit (Marian Keyes and what not) is together on one shelf. My scifi shelves take up a lot of space. I put Harry Potter and my Lion, Witch, Wardrobe series altogether. Usually I choose books based on the genre I’m interested in reading, so this works best for me. Oh I like that idea of shelving on genre! I don’t think I’ve heard of that method before. I also usually choose books based on the genre I read, but I usually decide what to read first and then get the book from my shelves (I usually know aproximately where a book is located) or I just stand in front of my shelves until something picks my interest. 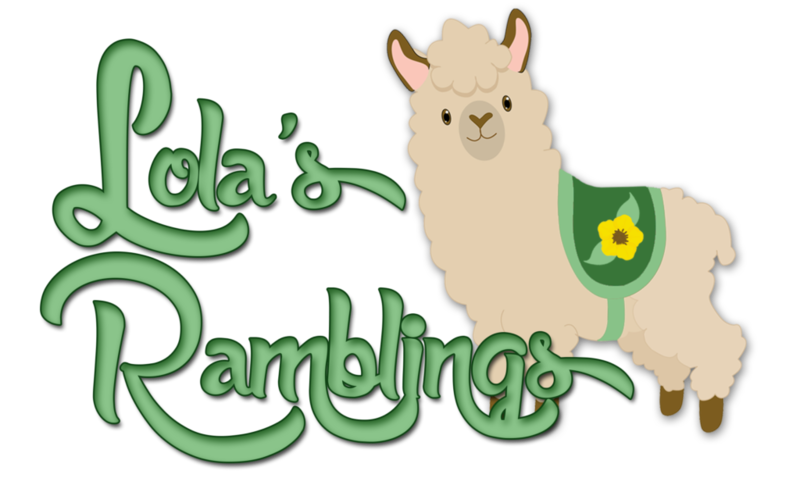 Lola recently posted…Lola’s Ramblings: How do you shelf your books? I love your bookshelves. I have three bookshelves in my bedroom, one in the living room and a small one in the hallway. I order them by genre and author mostly. But the one in the living room is for ones that I haven’t read and once I read them I move them into a shelf in the bedroom. I considered making a shelve for books I haven’t read, but I would hate to break up a series. I do like the idea of shelving by genre, I never thought of that idea before! We didn’t have room in this house for bookshelves in the bedroom. I love their Billy shelves, they are affordable and they can fit lots of books in them. I have heard of Dewey, but not sure what the shelving method is. Most of my dutch books are close together, but there are also some english titles on their shelves. You must be pretty familiar with that classification system then. I can understand that you would use it at home as well. I shove all my spices on multiple shelves and remember where I put them, kinda like I do with my books. Chaotic, but it works for me. OOo yay! Look at all the pretties. I love seeing what people do. I have Ikea shelves too. Can’t remember the model of them but I love them. I have my unread ones downstairs on the living room shelves that are just grouped by beginning letter of last name but no order in each letter. Then my read go upstairs until the guest room shelves and those are grouped by author. No order alphabetically though. They’re by who they fit with feel wise and by favorites. So absolute favorites are behind the glass shelves. Least favorites on the bottom corner shelf that’s hard to get to, etc. Then random review books are here or there either on a smaller bedroom shelf or one in the living room. There’s books pretty much everywhere. IKEA shelves are awesome :). I really hope to get another shelf eventually as I could use the extra shelving space, these are almost completely full. My unread books are in between my read ones. My leats favourites book often end up on the lowest shelves as well and some books that didn’t fit anywhere else. I like your idea of just grouping them by author and where they fele right! Most of my books are contained to that room, with the exception of the book I am currently reading and my Kobo and ipad. Your shelves of books and other precious items are so colorful and friendly to browse through. I like your system of sorting and how you figured out how to use the different sized shelves. I am one spoiled cookie when it comes to shelves. My husband custom built my shelves. I have five floor to ceiling shelves in the family room, one build in display shelf in the hall, and two short shelves in the extra room. This does not include my basket of books beside the bed and another basket of books by my reading chair. See? Spoiled! LOL! As to the arrangement, hubby built the shelves with three different distances between shelves to match the sizes of books we have. Top shelves are shorter for books the size of mass market, middle shelves fit the trade paperback and most hardback size, and the lower shelves are for the odd sized taller or heavier books. This caused the same issue you had to figure out how to group the books in some semblance of order while getting them to fit. For the most part, I grouped by series and author, but didn’t bother with the alphabetical. I thought about also trying to group by genre, but that’s too hard because of the shelf sizes. Just like you, I also have nick knacks and fun little items sitting on the shelves in front of my books My all time favorites like my Jane Austen collection ended up on the built in display shelf. 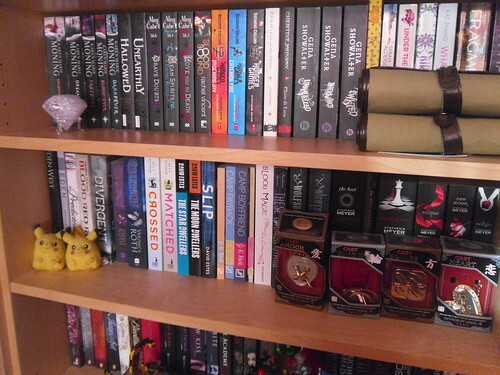 My YA books mostly ended up on the shorter shelves. My baskets are where I keep the ones I plan to read soon or am currently reading. Thanks! I wnated to fit as much shelves in each case as possible, so it’s important to make the best use of them as else not all my books fit. Oh I LOVE this! I love taking a peek at other shelves, everyone seems to have such different ways of doing things. Right now I am… in between systems. Nothing is working, basically. I am switching bookcases with my son soon, and that will give me more room for read books. I have two TBR shelves, one is an “urgent” shelf, and the other is just regular old TBR. Then I have a favorites shelf and a Hunger Games shelf above my desk (yes- a whole shelf, all full of Hunger Games editions! YAY! )but then my already read books are on this weird tiny bookcase that is going to Sammy, because I need a better one, I just do! Incidentally, all my Sookie books got shoved in a box when the series ended so crappily, and now she doesn’t take up ANY room on my shelves 😉 OH but I did like the Harper Connelly series! I always like seeing other people their shelves, so it was fun to share mine as well :). And there are so many different ways to shelve your books, it’s been very interesting to read the coment on this post and hear how other people shelve their books. That’s pretty awesome you have a whole shelf with Hunger Games editions. I still haven’t read the last book of the Sookie series, but that series kinda introduced me to adult urban fantasy so it will always have a special place on my shelves even though the series doens’t match. And the Harper Connelly series is awesome indeed! My system is broken at the moment. *laughs* For the most part, I have books sorted alphabetically by author. With series together. 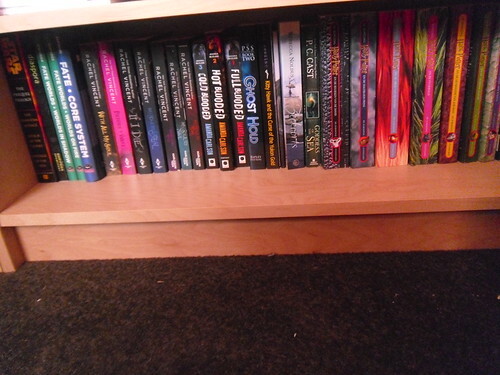 But my hardbacks are on a different bookshelf from my paperbacks. UNLESS they’re part of a series. And then it depends. If I have more paperbacks in the series, then the entire series is shelved on my paperback bookcases. If there are more hardbacks, then everything is put on the hardback bookcases. And then I got into the problem of adding new books. When I ran out of room on a shelf, I didn’t want to have to move over every book by one or however many, in order to put the new book in the right place. So if it’s a series book, they get laid on their sides on top of the rest of the series. Until it bothers me enough to shift books around. If it’s not a series, or a series I’m only just starting, the books are sorted onto the next free shelf. Alphabetically by author again. Which can get confusing. I have stuffed animals, and other toys on the tops of my bookcases. Bookends, little figurines, and such standing on the shelves in front of the books. I love how neat and ordered your books look! But it would drive me batty to sort them that way. Sounds like your system works pretty well, although I did cringe at the lying books on their side. I ahd to do that a few times and don’t like it. The whole having to move every book thing is why I don’t shelve alphabetically and I rather know where to find each book as each book has their own place, I don’t shift them around too much usually. And wow you have a lot of bookcases. 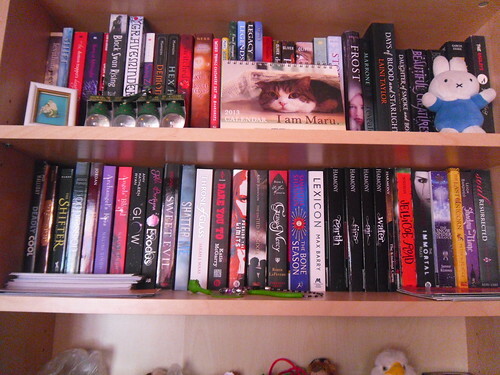 My favourite authors are on the easier shelves usually, although I consider most shelves easy except the lowest ones. Reshelving your whole system sounds like a lot of work indeed. I like having all sort of knicknacks in front of my books. I can’t really imagine shelving my books any other way. Oooo! I love your shelves. My biggest one broke a few weeks ago so I will be shopping for new stack holders soon. I might use some of your ideas. Thanks! I hope you can get a new bookcase soon, that must have been horrible when it broke! Thanks for sharing your shelves! I love seeing how other people do them and I kind of live vicariously through them since I don’t really own/buy books anymore. I still daydream about how I would organize my shelves if I had any… Well, actually I just bought my first little bookshelf since I moved into the house that I’m currently in. It mostly houses library books though! It’s so fun to see other people their shelves indeed :). That’s a shame you don’t own/ buy books anymore. I dont buy as many physical copeis as I used to ever since I got my e-reader, but I am still happy with my collection. I love miffy, I have a few more plushies of her around the house and my tea mug ofcourse. My mom and sister once bought that miffy for me for my birthday. It’s the kind of toy that makes sound when you move it, like a rattle. They told me that when they bought it the shop owner asked how old the baby was and then they told her I was a teenager, lol. I am kinda hoping I can get another bookshelf, maybe when it’s christmas as I probably will run out of space later this year, I already have one book that didn’t fit as all the right lenght shelves are filled. I am really spoiled to have a whole room for my books. I love looking at other peoples bookshelves but I’m cringing inside because of the state of mine at the moment. I have them all in a spare bedroom/office and one wall is fitted out with floor to ceiling shelves that my husband made for me. So I’ve got great storage but the whole room is a giant mess at the moment and I need to ruthlessly organise it. It’s such a huge project though that I keep putting it off. I like your idea of keeping series together where possible and I love that you have a stack of bookmarks out on your shelves too. That’s a great idea, I always have to go looking for one when I need one but I like the idea of them being on the shelves. And I don’t think your shelves are messy, I like objects on shelves too as it feels more personal. And that penguin is fab! Having space to shelf all my boosk really helps to keep them looking sort of neat, although I probably need another bookcase end this or early next year. Although those floor to ceiling shelves along one wall sound really cool! And that’s so awesome your husband made those himself. I can understand you not wanting to start on such a huge project, although it’s probably nice once you got it done. I have all my bookmarks close to my books, either in my picture album or on that shelf. So when I pick a book I also pick a bookmark. I also like having objects on my shelves, but I am used to people saying that it makes them messy. I love that penguin my bf made for me, it’s awesome! Your shelves are so pretty, mine are so messy…lol. In my opinion my shelves are pretty messy with eveyrthgin in front of them. But then I haven’t seen many other people their shelves and I don’t like to put books on top of others, so I guess that makes them look pretty neat. I love your bookshelves. I don’t have nearly as many as you do, mostly do to lack of space. DH won’t let me get any more. 🙁 I try to keep series together as much as possible. The exception is when a series goes from paperback only to hardback. Those get split from my paperback shelves to my hardback shelves. I like to keep paperback and hardback together because I keep the shelf heights so that I can fit the most books on the shelf. I also keep mass market paperbacks together and trade paperbacks together for the same reason. I do try to get authors together, but sizes are more important because of space. I also try to keep series in chronological order. Great topic. I was pretty stubborn an didn’t want an e-reader at first and back then had enough money to just buy everything in physical format after a year or two of buying books like that I got quite a big collection. Nowadays I only get a few books each year in physical format, maybe 10-15 at most. I agree size is often more important than space, but I still try to keep the books of my favourite authors together if possible. I also keep series in chronological order, but it depends on the series if I list them from left to right or right to left. I love your bookshelves, I love being nosey and seeing other peoples shelves! I have three bookcases at the moment, one glass fronted one where I keep my cookbooks and foodie writing books, then I have bookcase A which is mostly YA / Dystopia and is sorted by author and has all my Charlaine Harris books on top then I have bookcase B which is everything else! I need at least two extra bookcases as I have older books in a cupboard that need to see the light of day! Same here ;). I wish everyone would share pictures of their bookshelves, it’s so interesting to hear and see how other people shelve their books. I need an extra bookcase as well as I am running out of space soon. Thanks! I am really happy with how much shelf space I have. I think shelving how they look is a great wya to shelve! Your shelves must look very pretty!